1858: Smyrna - Aidin Railway opened. 1860: Euphrates and Tigris Steam Navigation Co. by Lynch. 1892: Istanbul - Ankara completed by CFOA, a German initiative. 1892: Jaffa - Jerusalem, meter gauge. 1892: Baku - Tbilisi completed, 1900 to Kars, 1908 to Djulfa, Iran. 1899: Merw - Kushka completed, project Russian - Indian Ocean. 1903: foundation of the Société Impériale Ottomane du Chemin de fer de Bagdad (Bagdadbahn), connected with the CFOA. 1905: Cyprus Government Railway Famagusta - Nicosia, 2 ft 6 in gauge, with a "boat-train". Closed down in 1952. 1908: Hedjaz railway Damascus - Madinah, 1.05 m gauge. 1911: Kurier St. Petersburg - Moscow - Kislovodsk/ - Baku - Batumi, later Leningrad - Baku - Tbilisi with an ex-CIWL sleeper. 1917: German military railway, gauge 0.60m, on the Taurus. There had been various allied military railways in the Middle East. 1918: Palestine Military Railway Egypt - Haifa. 1918: Zahedan (Iran) connected by rail with India, no connection to the West; 1932 -1942 interrupted. 1920: Meter-gauge Baghdad - Basra. 1920: "Cairo Express" Haifa - Kantara East with a CIWL sleeper, connecting with train Port Said - Kantara West - Cairo, with CIWL diner and later Pullman. 1921: Kabul - Darulaman, the only railway in Afghanistan. 1924: First CIWL WL Istanbul - Ankara. 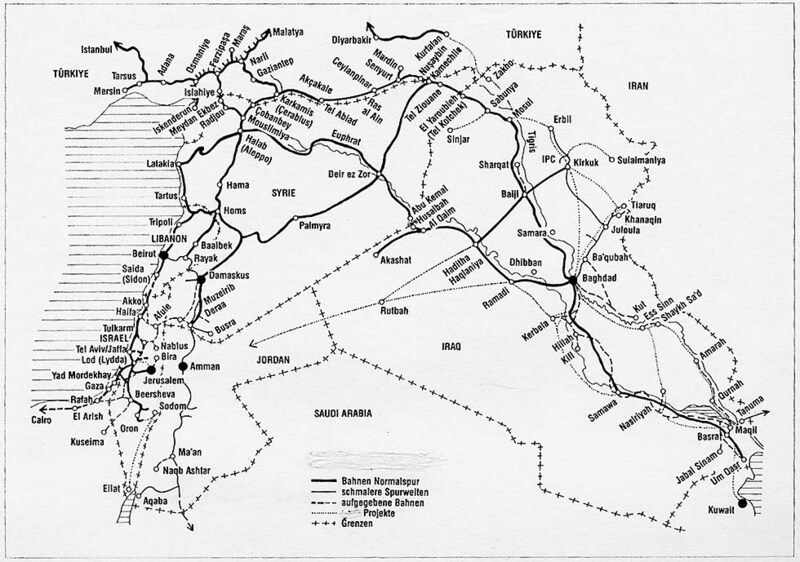 c. 1924: Hedjaz railway to Arabia destroyed, but International Train Damascus - Amman started. 1926: WL CIWL Istanbul - Konya - Adana extended to Alep. 1927: All-sleeper Anatolie-Express Istanbul Haidarpasa - Ankara by CIWL, initially teak cars. 1928: WL extended to Tripoli, with fourgon-cuisine, and to Rayak. 1930: Taurus-Express (Toros Ekspresi) introduced, with blue CIWL sleepers and Turkish coaches Istanbul Haidarpasa - Nusaybin and Rayak motorcar connections to Kirkuk and to Haifa, connecting with the Cairo-Express Haifa - Kantara East. 1933: Chemin de fer Bozanti - Alep - Nissibine succeeded by Cenup Demiryollari (1937 TCDD) and Lignes Syriennes de Bagdad (1945 DHP, then CES). 1935: Taurus-Express via Ankara instead of Konya. 1935: De Dietrich railcar Alep - Tripoli. 1938: Trans-Iranian railway Bandar Shapur-Tehran-Bandar shah. 1940: Taurus-Express to Baghdad, connection to Basrah, British India Line steamers to India. 1945: All-sleeper Ankara-Express Istanbul - Ankara, blue CIWL cars, later blue Turkish sleepers. 1945: Tuapse - Samtrediya completed, the direct Link Russia - Georgia. 1947: Taurus-Express with a sleeping-car Istanbul - Beirut. End of the train Haifa - Cairo. 1948: Last Cenup section to TCDD. 1948: Foundation of Israel Railways. 1948: Train Rafa -. Kantara East, initially with CIWL WL. 1951: Railway Dammam - Riyadh. 1953: Trains Haifa - Tel Aviv. 1954: Taurus-Express (Toros Ekspresi) also Istanbul - Gaziantep, 1956 also Iskenderun. 1956: Sinai war, 1957 Egyptian train Gaza - Cairo (until the war of 1967). 1959: Soviet sleeper Moscow - Djulfa, connecting 1st class Djulfa - Tehran. 1960: Taurus - Express also Istanbul - Gaziantep - Baghdad, in combination with existing Taurus-Express Istanbul - Alep - Baghdad. 1963 or 64: Sleeper Moscow - Akhurian, from 1967 by express "Druzhba" Moscow - Yerevan, from 1978 to Dogukapi, TCDD train to Kars. 1966: International Train Damascus - Amman (?). 1968: Trains Baghdad - Basra standard gauge. 1969: Taurus-Express temporarily diverted via Malatya. 1971: Taurus-Express Istanbul - Gaziantep - Baghdad in addition to the existing service Istanbul - Aleppo - Baghdad (until 1976) and Istanbul - Beirut (in 1972 confined to Aleppo). In 1970 Istanbul - Basrah had been announced. 1971: Vangolu Ekspresi Istanbul - Tehran, initially with change of trains at Lake Van. Van-Tabriz combined with freight, stopped in 1980 or 81. 1972: WL CIWL taken over by TCDD. 1973: Soviet RIC sleeping car Moscow - Djulfa - Tehran, stopped in 1980, then resumed for a short time. 1973: Lattakia - Alep completed. 1977: Taurus-Express no longer to Baghdad. 1980: Service Alep - Dayr az Zawr - Qamichli (Kamechlie) - Baghdad, then interrupted. 1982: Service Turkey - Baghdad, then interrupted. 1982: Soviet broad gauge to Hairatan, Afghanistan. 1983: Ankara Ekspresi Istanbul - Ankara, exclusively sleepers and diner. 1983: Taurus-Express Istanbul - Gaziantep now with a branch to Aleppo. 1983: Trains via Homs to Damascus. 1983: International Train Damascus - Amman interrupted. 1988: Taurus-Express Istanbul - Gaziantep via Konya (c. 1998 temporarily interrupted east of Adana). 1989: Gaziantep Mavi Istanbul - Gaziantep. 1990: Train Damascus - Amman, later with change of trains at Deraa. 1993: IC3 diesel multiple units from Denmark on Israel Railways. 1995: Bafq - Bandar Abbas completed, trains Tehran - Bandar Abbas. 1996: Mashhad - Tedzhen (Turkmenistan) completed, trains Mashhad - Sarakhs (border). 2000: Van - Tehran service resumed, Transasya Ekspresi Istanbul - Tatvan, Van - Tehran. 2001: Train Damascus - Fevzipasa - Malatya - Tatvan, Van - Tehran. 2001: Taurus-Express Istanbul - Gaziantep now with a branch Istanbul -– Syria. 2001: Train Gaziantep - Baghdad reportedly with a branch Damascus - Alep - Dayr az Zawr - Qamishli - Baghdad. 2003: Train Tehran - Mashhad - Bukhara announced. 2003: Iraq war, after the war in Iraq only Baghdad – Basrah. 2006: Tourist special Istanbul – Damascus – Istanbul, also further departures. 2008: Services Russia – Georgia interrupted by South Ossetia War. 2009: First section of the high-speed line Istanbul – Ankara opened, CAF train sets HT65000. 2010: Gaziantep – Alep started, but Taurus-Express remained suspended. 2010: Re-opening Gaziantep – Mosul expected. 2016: Fast Link Tel Aviv – Jerusalem expected. Gauge: Standard gauge, Hedjaz and Aqaba 1.05m, Baghdad - Basrah initially 1m, Russia 1524/1520 mm, Zahedan - India 5ft 6in.